1. Pre-heat the oven to 175 C° (top and bottom heat). Clean the cherry tomatoes. Peel garlic and push through a press. Mix vinegar, olive oil and thyme in a bowl. 2. Put the tomatoes in an oven tin, add garlic and the oil / vinegar mixture and sprinkle almond flakes on top. Bake for 30 minutes. 3. Peel the sweet potatoes, cut into large chunks and cook for 15 minutes until soft. 4. Remove the tomatoes from the oven. 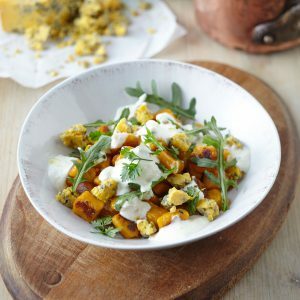 Mash together the cooked sweet potatoes with almond drink and coconut oil. Season with nutmeg, cinnamon, salt and pepper. 5. Clean the basil, pat dry and finely cut the leaves. 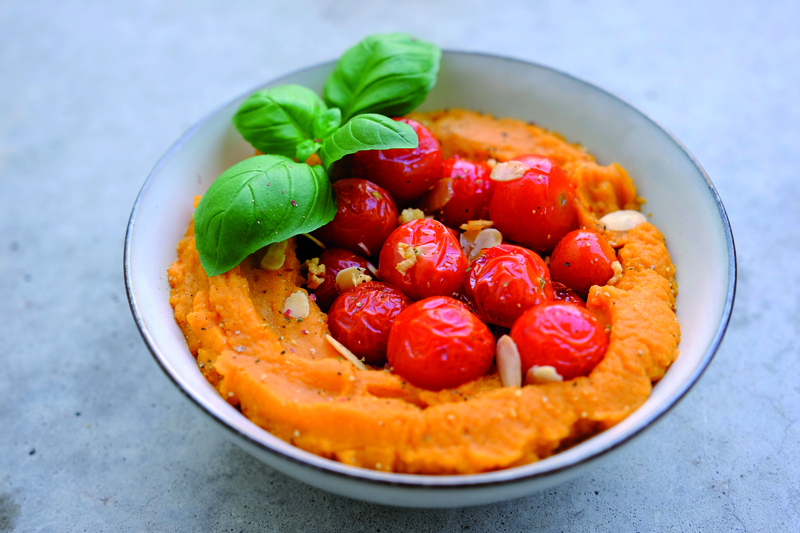 Place the sweet potato mash and the roasted tomatoes on a plate and garnish with fresh basil.